We are a community church and we welcome everyone. We are as diverse as the Town of Tinmouth. We are old-timers and newcomers, carpenters and loggers, dairy farmers and maple syrup-makers, teachers, business owners and engineers both active and retired, secretaries, contractors, nurses, conservationists. Our religious backgrounds range from the Quaker to the Catholic, every person finding a loving welcome in this “small congregation with a big heart.” Our several elderly members bring an enriching link with our past, along with their unique individual gifts. We have been happy lately to welcome a dozen attendees from towns as far as 35 minutes away. 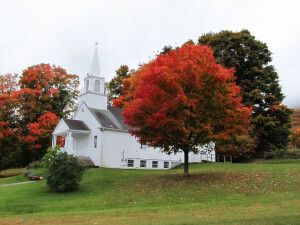 Church attendance varies between 15 and 50, often doubling for holiday services such as Christmas, Easter and Thanksgiving or other special occasions. And now we are happy to welcome you!